First off – this post will contain spoilers. But I guess that’s a given today. We’re now at the point where the books and the tv show have converged. Daenerys has flown north and is clearly deep in the Dothraki Sea. Cersei is back in the Red Keep, and Jon Snow is – well he’s not in a good place. 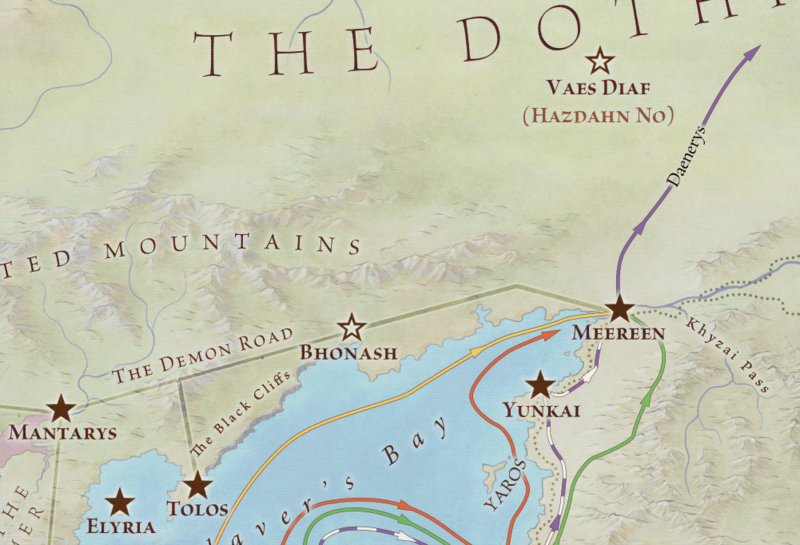 One of the maps in Lands of Ice and Fire maps the journeys of all the characters from the start of the books to their positions at the end of A Dance with Dragons. I’ve avoided talking too much about this map, up until now. We’re caught up, so here’s a quick summary of where we’re at. In the map above, you can see the nexus that is Castle Black. You can see Jon’s long looping path up into the Frostfangs and back when he joined the wildlings. You’ll note there’s no path for Jon to Hardhome and back. The Hardhome excursion was exclusive to the tv show – though what that showed was alarming from its proximity alone. His line ends at Castle Black. But critically, the crimson path of Melisandre also ends at Castle Black. We know that Thoros of Myr was able to bring back Lord Beric Dondarrion multiple times after his many gruesome deaths. But each came with a price. So we will have to wait a year to find out if Jon’s line really ends here, or if it just a temporary pause before he travels forth again. 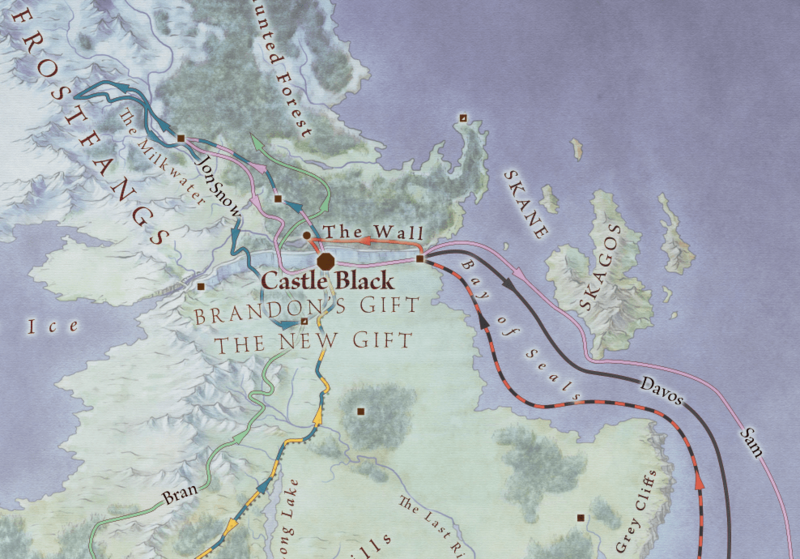 Sam’s line has headed to Eastwatch, where he takes a ship for Oldtown, and Davos never quite makes it to Castle Black in the books. Finally, there’s Bran. We’ve not seen Bran this season – he dropped off the radar when he delved into the earth and found a man wrapped up in a tree in his pursuit for the Three Eyed Crow. But that makes him an interesting, sorcerous, Stark, poised north of the Wall. That’s a line to follow closely in the next season (and in Winds of Winter). At the other end of the world, we have Meereen. Daenerys flew out of the city on Drogon, but we didn’t see which direction, or how far. She flew north, into the heart of the Dothraki sea. So it’s not so surprising to see her corralled by a herd of blood riders. Behind her, she leaves a city that is drawing people to it like a magnet. Tyrion has turned up (the gold line). In the novels we also still have Ser Barristan – the white line, and one of the more shocking deaths of the tv series for book readers. Red is Victarion, and green is Quentyn Martell – these last two not featuring in the HBO version at all (yet). But Dany is not there. Her dragon has taken her north, and only time (and the next novel/season) will tell where she goes from here. When we get away from these characters, the tv show ends up far from the books. Jaime doesn’t go to Dorne, Briene doesn’t make it north of the Twins, and Sansa is still at the Eyrie. But whichever version of events you follow – the characters at the heart of Game of Thrones – end both the book and the season in peril. The night is dark and full of terrors. The maps in this post are excerpts from the Journeys map that I illustrated for Lands of Ice and Fire, and would not have been possible without the excellent support of Elio and Linda of Westeros.org who meticulously plotted the paths of all the characters through all the published novels. The full Journeys map is here. 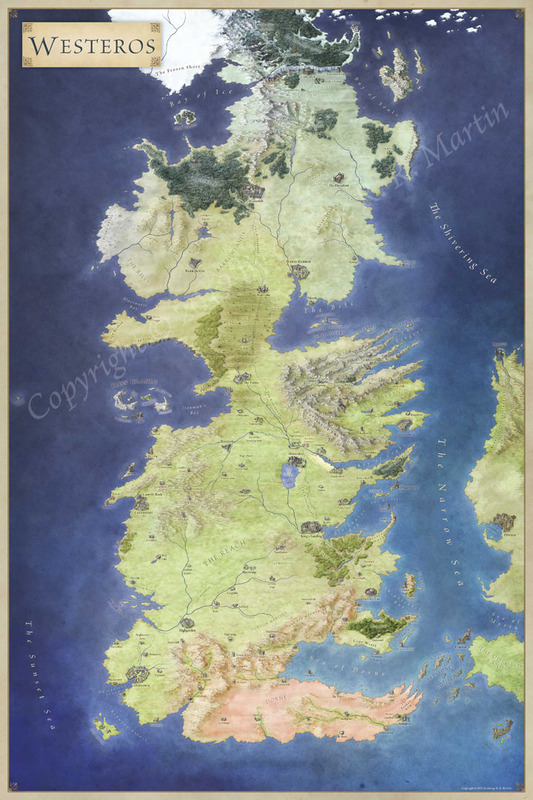 Previous Previous post: Where is Hardhome?